Cotton is both a wild plant and a plant that has been hybridized for commercial purposes. 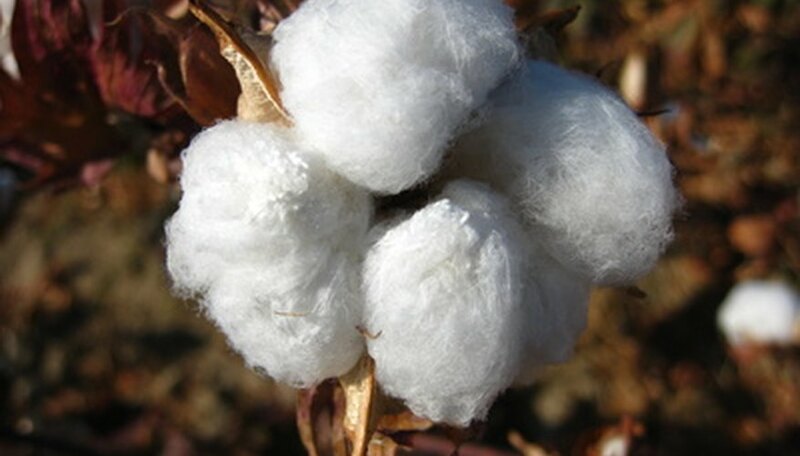 While there are several species of wild cotton, the most common species used commercially is Gossypium hirsutum, according to the U.S. Department of Agriculture. This is the species that has been bred to be disease-resistant and is responsible for almost 90 percent of the world's cotton production. G. hirsutum is also called "American upland cotton." The cotton plant is a tender perennial. This means that the plant will only grow year after year in areas that are warm and tropical in nature, such as the far southern part of Florida. For this reason, the plants are treated as an annual in many areas and in cultivation. Commercially grown cotton plants are destroyed after the cotton is harvested, according to the University of Oklahoma, and new plants are seeded. Gossypium hirsutum is the most common cotton plant in the United States. Another species, G. barbadense grows in the islands of South America and in Egypt. In Asia, G. herbaceum is the main producer of cotton, along with G. arboreum, according to Fact Monster. Cotton plants are medium-sized, loosely-branching shrubs. They can reach a maximum height of 5 feet, according to the University of Oklahoma, and have 6-inch wide, lobed leaves. The plant blooms in the spring with simple white flowers and seed pods in the fall. The pods are lined with large amounts of cotton fiber. Cotton plants need full sun exposure to thrive. This plant does not tolerate shade and will not grow well at all if planted under a tree, according to the U.S. Department of Agriculture. Cotton plants enjoy consistently wet, but well-draining, soil and grow best in areas that receive regular amounts of rainfall. Once the flowers fade, however, irrigation is reduced while the cotton is harvested. It takes a long time from planting a cotton seedling to the harvesting of the cotton. Plants bloom on average around 95 days after planting. Then it's another 70 or 80 days until the boll (pod) opens to reveal the cotton, according to Purdue University. In most cases, the cotton is harvested by hand,\ because this results in more cotton and in higher-quality harvests. The cotton is simply plucked from the plant, then sent to a machine, a gin, which removes the seeds.